SYLHET, Feb 10: Work on the much- talked about Sylhet-Tamabil-Jaflong highway has been started. The project worth Tk 1.98 billion was approved at the ECNEC in June last year. Accordingly, bidding and other formalities were done and the work began on the highway's Jaintapur- Jaflong portion recently, informed the Executive Engineer of the R & H, Sylhet, Ritish Barua on Saturday. It would take a year to complete the road reconstruction job, he added. The busy road had been in a pitiable state for long with a number of potholes and cracks on places. Especially the 16-km from Jaintapur upazila headquarters to Jaflong and Tamabil had become worst as the last year's floods had badly damaged it. During the monsoon or even on moderate shower the whole road becomes unusable due to innumerable potholes at places. On the other hand, plying of overloaded trucks, carrying stones and boulders caused much damage to the busy road, linking Tamabil border points. Its importance went up with the start of full-fledged Tamabil Land Customs Station in 2017. Moreover, the number of tourists from different areas of Sylhet region as well as all over the country to Jaflong registered a rise recently. Several thousand vehicles of all types do ply through it. Especially the number of trucks, overloaded with stone marked a rise in recent years. 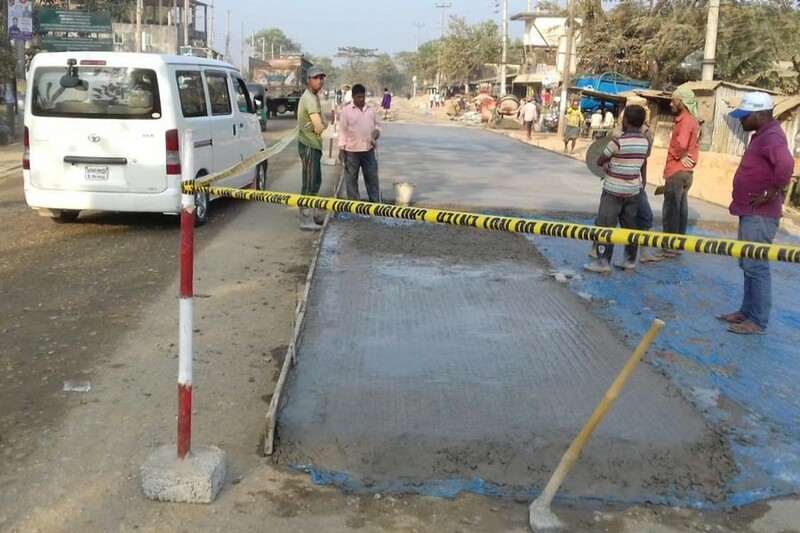 The official also said of the total, Tk 1.25 billion would be spent for the road development wors on the 16- km Jaintapur-Jafflong-Tamabil part while the rest amount of Tk 65 million would be spent for setting an axle load control station near Darbast Bazaar area, for construction of 02 inter-sections at Tamabil and Mamar Dokan area in addition to land acquisition cost for the project. Trader Luthfur Rahman at Jaflong Bazaar said the number of tourists is rising day by day. But they suffer a lot for the worn out state of the road. The authority should try to complete the development of the highway soon, which also plays an important role for transporting imported goods from Meghalaya. Cost of imported goods goes up due to the additional transport charges as the road had been in a pitiable state for long, said some importers with the Tamabil Land Customs station.